February 8, 2010. Tags: Superbowl Google ad tiger woods, Tiger Woods, Tiger Woods Google spoof. Celebrities, Comedy. Comments off. J.D. left his radio show to run against John McCain for AZ Senate. J.D. was my CongressCritter at one time and although we disagreed about everything then (height of my liberal-ness, lol) he always took the time to write me a personal response addressing my specific concerns. Big points for that in my book. Not sure what to expect from the GOP primary now that Sarah and Scott Brown are coming to town to campaign for MAC. February 8, 2010. Tags: Arizona politics, AZ Senate race, Conservative Politics, deficit spending, GOP Politics, J.D. Hayworth, JD Hayworth, John McCain, McCain Senate race, Obama economy, Sarah Palin, Scott Brown, Tea Party Patriots. Economy, Obama Administration, Politics, TARP, Taxes, Unemployment Statistics. Comments off. I LOVE the Universal monsters. Cannot wait to see this! Nearly 70 years after Lon Chaney Jr. first howled at the moon, Benicio Del Toro is slipping into his signature hair, ears and underbite to bring the classic Universal monster to life in Joe Johnston’s remake of The Wolf Man. With Anthony Hopkins, Hugo Weaving and Emily Blunt along for the ride, and the visual effects make-up artist behind The Howling and An American Werewolf in London, it looks like this remake has got some serious teeth. February 8, 2010. Tags: Benicio Del Toro, Emily Blunt, Hugo Weaving, The Wolfman, The Wolfman remake, YourGeekNews. Celebrities, Entertainment, Fantasy, Fiction, Film, graphic art, Horror, Mystery, Popular Culture, Sci Fi, Supernatural, Suspense. Comments off. Hardly seems fair does it? Ken Lewis loses his spot at BofA, gets civil complaints filed against him by Cuomo, gets grilled by CongressCritters as attorneys drool on their TVs hoping for a magical shareholder class action suit, and Thain walks into a new CEO suite with hardly a scratch. Vagaries of the dice toss or a deal with Beelzebub? Maybe it’s just that Ken is from Charlotte and John is from The Street? Must be his ‘Goldman’ parachute, heh. 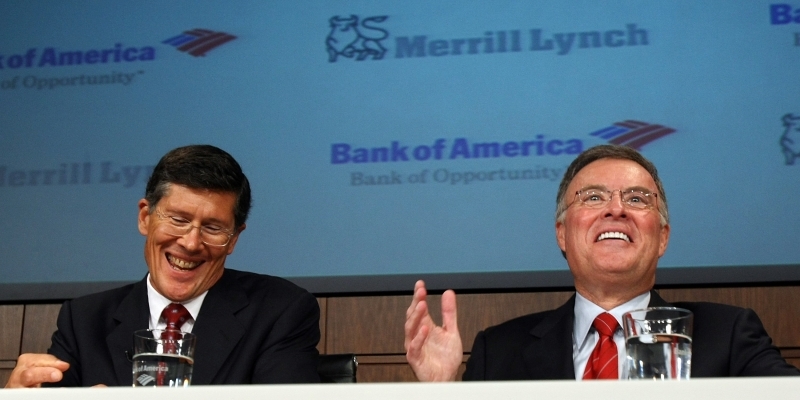 FD-MiM are Merrill/BofA shareholders….Our multitude of posts on the BofA Merrill merger and post merger brouhaha here..
John Thain has been chosen to run lender CIT, after a year in which he was ousted from Merrill Lynch and the business lender teetered on the brink. Thain will start as chairman and chief executive immediately, CIT said late yesterday, replacing interim head Peter Tobin. Thain, 54, led Merrill for a year, when he was shoved out in January 2009 after the company was bought by Bank of America in a controversial merger. The former president of Goldman Sachs and the New York Stock Exchange has been out of work since. CIT, a major business lender that expanded into subprime mortgages and student loans during the boom, filed for bankruptcy last year after the government refused to give it a second infusion of rescue funds. It emerged from bankruptcy in December, after managing to unload more than $10 billion in debt. “Much has been accomplished in recent months to position CIT for renewed success,” Thain said. CIT executives face compensation restrictions because it received funds from the Troubled Asset Relief Program. According to reports, Thain will receive $500,000 in salary and $5.5 million worth of restricted CIT shares. He could also earn another $1.5 million in restricted shares. You know who should pay the shareholder suits? STANLEY O’NEIL, he destroyed Merrill IMO…. February 8, 2010. Tags: Andrew Cuomo, Bank of America, Charlie Daniels Band, CIT Group, John Thain, Ken Lewis, Merrill Lynch, Mickey Mouse, SEC Bank of America. Economy, Finance, Politics, Popular Culture, TARP, Wall St. Comments off.